I love rats, Aniello. I Embrace them — rats, mice, walls, amoebas, frogs — I Embrace everybody. I Love everybody. I want to Wake Up every being into this Ecstasy in the midst of death. I have no righteousness in Me, no moral righteousness on any point. I am willing to become incredibly ridiculous to Wake you Up. I do everything! I have no moral righteousness in Me, no un-Love. I make no distinction between beings — humans, rats, amoebas — none. On this day a remarkable dialog took place between Adi Da Samraj and Aniello Panico, who, at that time, was serving in the kitchen at Adidam Samrajashram in Fiji. Aniello had discovered a large rat there — surrounded by the corpses of five mice, whose heads had been chewed off. Repelled, Aniello had asked Adi Da for one of the cats on the island to "take care" of this rat. ANIELLO: Now, everybody here would call it a mouse, but I'm from New York, and I know it was a rat! He was easily six inches long. He was looking at us and thinking he was as cute as Mickey Mouse. 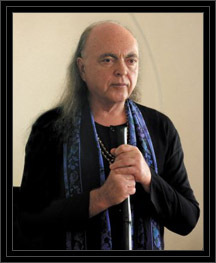 AVATAR ADI DA SAMRAJ: They are cute, Aniello. I don't mind them. ANIELLO: But, Master, he wasn't alone. There were four or five little mice with their heads eaten off! This killer was trying to look cute, as if he were at Disneyland, but that devil had eaten those little mice's heads off. AVATAR ADI DA SAMRAJ: Eating beings is always disturbing — not necessarily the eating, but the witnessing of the eating. There is nothing I can do about this, Aniello. This world is dreadful. Do you have any idea what is happening in conditional nature? All beings are My own. Yet, you must sacrifice them in order to live. You beings, you humans here, require the murdering of living beings to eat and survive. You must come to terms with this fact. To do so you must come to terms with your own life and death and accept the fact that you are a sacrifice, and that conditionally manifested existence is not merely a jolly time. All of you could potentially die a painful death and live a painful lifetime. By entering into relationship with Me, I am Giving you another slice of possibility. Do not become overly disgusted by the manifestations of non-human creatures, Aniello. Accept your own state and the fact that you, in a sense, eat heads and require the pain of beings to live. Beyond that, know that you must accept the pain of life and death. You are a sacrifice. To exist in this form is revolting, treacherous, and potentially painful. Some few may slide through with comparatively little pain and die in bed, but of the beings on this planet, how many do? Human beings are not gods and goddesses here. All suffer the fate of animals. All must come to terms with this and, out of compassion, relieve as many as possible from that destiny. Do you know how many dreadful deaths human beings have suffered compared to your mice? There have been much worse. And how many fear death? How many fear that kind of death? Everyone does. All are meat and can be eaten. Luckily for you, you get to Commune with Me and live the Truth and be Delighted and experience Ecstasy while manifest in mortal form. So you have the potential to do something different, but you do not have the potential to not sacrifice. Conditionally manifested existence is participation in sacrifice, and there is no reason to be righteous about that fact. You should be humbled by the knowledge. You cannot even breathe without sacrificing self-conscious beings. You cannot walk or move, you cannot live from day to day, without taking life in some form. You may eat an orange or a bit of lettuce in your salad. Look at your plate. Look at the sacrifice. Do not be guilty about it. Know it. You are not yet so different from the rat. You eat heads, too. You are revolting. You are flesh. You are to be sacrificed. You are a sacrifice in your most precious form, that to which you would most dearly cling. You are! Be revolted, but be illumined by your knowledge. Make changes. Devote your sacrifice to changing existence. Do not be happy about it, but do not be righteous either. This is My advice, Aniello. All beings are suffering the obligation to be eaten. I want to Give you the alternative, even though you may be eaten and even though you eat in the meantime. I want to Give you the Vision of My Glory, Wake you Up, Give you Ecstasy, the Experience of Happiness and Fullness, even while you are dying, not to mention while you live. This is a real and very important matter. I am not here to deny you the knowledge of what you are experiencing and what other beings experience. I am here to sensitize you to what all other beings experience, what other forms — like these curtains and that fan — experience, even though they may not even appear to be conscious. You think there is no consciousness in these so-called objects. There is nothing but Consciousness Itself, everything threatened by the fact of existing in conditional form. I have great Love, Compassion, Feeling. I do not look down on the rat, Aniello. That poor sucker breaks My Heart! And you should feel likewise, if you love Me. I am here to sensitize you to your own sacrifice and the sacrifice of others. I am here to Call you beyond it, not to deny it. A lifetime here is so short. The logic of existence itself, when you know Me, transcends these murders, this ugliness, these limits. Where do you think you are? You deny the rat your love? I deny no one. I draw no lines around Me. I Love all!